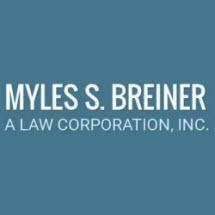 Myles S. Breiner - A Law Corporation, Inc. The Law Offices of Myles S. Breiner, ALC, Inc., is a criminal defense law firm that represents clients in Hawaii who have been charged with a variety of offenses, from homicide to drug offenses to white collar crime. Myles S. Breiner is a familiar name for those who live in Honolulu: He is often consulted on criminal defense matters for local news broadcasts. The law firm also represents clients in matters involving personal injury, prisoner rights and civil litigation, including clients visiting Hawaii on vacation. The firm takes on a significant number of drug crime cases and related criminal defense cases that involve drug charges, including theft, assault and conspiracy. Myles S. Breiner also defends a significant number of clients who have been charged with homicide or manslaughter, in those cases doing everything possible to get the charges reduced. The law firm is committed to representing clients from a broad spectrum of society, from high-level public officials to individuals whose civil rights have been violated behind bars. The firm consistently seeks favorable resolution for criminal, personal injury and civil rights matters with integrity and a focus on reaching sustainable long-term solutions.